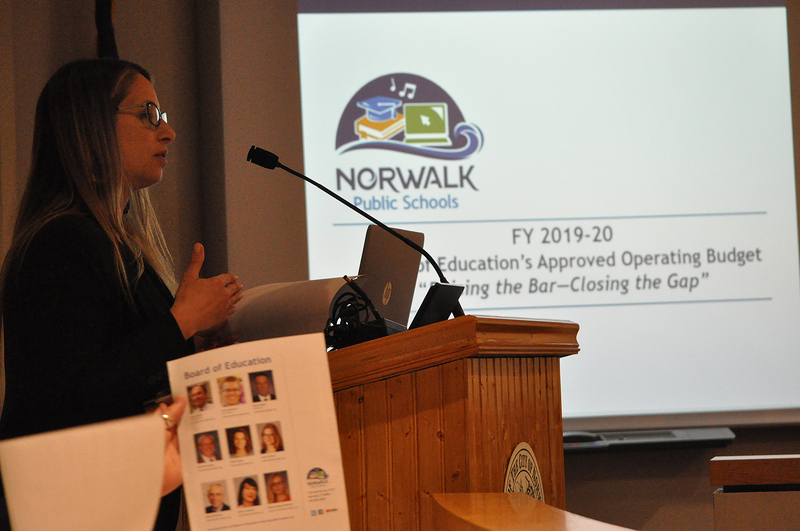 Norwalk Public Schools Budget Coordinator Kristen Karzcmit speaks Tuesday about the Board o Education’s 2019-20 operating budget request. NORWALK, Conn. – Norwalk Common Council members got a more-in-depth look at the Board of Education budget request Tuesday, asking questions that ranged from middle school sports to per-pupil spending. The $202.184,484 request for 2019-20 is $11,690,267 more than the 2018-19 approved budget, a 6.1 percent increase. Norwalk Public Schools Chief Financial Officer Thomas Hamilton, who is also helping the City with its budget after the sudden departure of Chief Financial Officer Bob Barron, revealed that there are talks going on behind the scenes. Hamilton and Norwalk Public Schools Budget Coordinator Kristen Karzcmit emphasized the expected trend of declining budget increases. The Common Council sets a budget cap on Feb. 26. Board of Education Chairman Mike Barbis and Finance Committee member Bruce Kimmel were not present. Meek said they had prior commitments. “Home ec, that takes me back,” Meek replied. There was a home economics class two years ago, Kydes said. The budget for middle school sports was cut in half in last year’s budget reconciliation. There’s talk about parents getting involved and starting interschool activities but, “kids that don’t have access to the leagues, the programs, the travel leagues, they relied on West Rocks as source to get out there in team sports,” Kydes said. Minority Leader Doug Hempstead (R-District D) said he’s “always been very perturbed” about the sign promoting the differences in per-pupil spending between Norwalk and its Fairfield County neighbors, including Stamford. BoE member Mike Lyons and Meek told him that the state calculates the per pupil expenditures, and Hamilton said the state requires every district to detail in-kind services and debt obligations, and other items. “There was an initial buildout to get the positions we needed when Dr. Adamowski joined the district but I bet if we looked at full-time equivalents in the last two or three years, it’s probably very flat,” Meek said. Karzcmit and Hamilton promised to send him information. There’s a need for tradesmen, jobs that pay well, Hempstead said, asking why NPS isn’t investing in those learning opportunities. Adamowski came in with a big emphasis on getting students ready to go to college but the Board pushed back and that’s why there’s a medical academy and a marine pathway, Lyons said. Parents are already asking for the Norwalk Early College Academy to be expanded, Meek said. “I don’t know how we ever compete with Wright Tech, other than just being here in town. But how do you do it more cost effectively?” he asked, with Hempstead suggesting that one of Norwalk’s magnet schools be a tech school. Council member Darlene Young (D-District B) asked if the more job-oriented programs could be provided in both high schools; Lyons said Norwalk is moving toward a choice model, and as the model evolves students could choose which schools they want to attend. “Seats are limited,” Young said. “If you double our capital budget we can solve that problem,” Lyons replied. Neighboring towns with top rated schools are becoming much more affordable so it’s confusing why the city continues on the path of a higher tax/mill rate trajectory in the midst of a stagnating to lower real estate market. This will further exacerbate an exodus of residents producing a boomerang effect on the city’s grand list by continuing spiking mill rates in the forward years to compensate for lower real estate values. In a city where most are not sending children to school, these practices are not a recipe for fiscal prudence. An underlying unstable home-ownership base is not what the city should strive for and perhaps a pause is warranted here. Is this $11.69M a one time cost? Or will it essentially be baked into every budget going forward? Why is it that such an essential service like “background checks” for hiring not be updated regularly. And would that really cost millions? Make Home Economics, or some type of real world basic personal finance course mandatory. This way we wont be graduating another class of fiscal-illiterates. Imagine if this was required since the 1960’s – we might not be a State on the verge of bankruptcy in a country with an out of control spending problem. Here is something to ponder. The entire financial system is based on what’s called “the Six functions of a Dollar”. To teach that would only require basic (not advanced) high school math. That knowledge and a $20 calculator would keep most people from making bad financial mistakes over their lifetime. BTW – didn’t we already have really big asks by the BOE in the past two or three years? All “one time” costs to catch us up? This is a one two punch on top of the recent artificially inflated reval and totally unfair to our retirees – why is the Board of Ed forcing fixed income households to find every reason to leave the city. This is neither fair or balanced. A properly funded school system benefits the entire city. Taxpayer-subsidized apartment construction benefits who? It’s important to keep this spending in context. Not only does Norwalk spend less per pupil than the surrounding communities (see chart – https://www.nancyonnorwalk.com/wp-content/uploads/2019/01/NPS-per-pupil-shenanigans.jpg), but we’ve been steadily slipping in comparison to the rest of the State. A ten-year analysis of Net Current Expenditure Per Pupil (NCEP) data shows that back in 2008-09, Norwalk’s NCEP ranked #24 in the State of Connecticut, out of 167 school districts, placing Norwalk in the top 15% Statewide. We were also only $611 less than Stamford at the time, and ranked very close to Stamford’s #21 position. By contrast, the most recent data from the State for FY 2017-18 indicates that Norwalk’s Statewide ranking has declined in the past 10 years to #77 out of 166 school districts, meaning that we just barely rank in the top 50%, at the 46th percentile. The delta between Norwalk and Stamford has grown larger as well, with Stamford recording a NCEP that is now $1,284 per pupil per year higher than Norwalk’s. Stamford’s NCEP is 7.3% higher than Norwalk’s, whereas 10 years ago, the variance was only 4%. Moreover, the data for FY 2017-18 indicate that Norwalk’s NCEP is $654 less than the Statewide average NCEP of $18,243, and is barely above ($163 per pupil) the Statewide median NCEP of $17,426. Given the far higher costs for labor (and just about everything else) in Fairfield County, the fact that Norwalk’s spending in below both the Statewide average and median figures is significant. As is the fact that we’ve been able to make as progress as we have despite lower spending (in some cases far lower spending) than so many other cities and towns (see https://www.norwalkps.org/UserFiles/Servers/Server_71596/File/departments/Communications/State%20of%20the%20Schools.pdf). It’s illegal for the City to reduce funding for the Board of Education, so once a budget is approved it’s a baseline for the future. So yes, the $11.69 million will be baked in going forward. Ranking against other towns in spending is only part of the story. Norwalk continues to be an alliance district school, which means it’s ranked within the bottom 30-33 school districts out of about 169 districts in performance. That means outcomes vs dollars spent can and should be improved, not just spending. And before someone jumps in and reminds you that we are number one in the DRG of urban districts, we don’t compare our spending to the other DRG school districts, so its irrelevant to my point. When you throw in the fact that ECS funding continually disproportionately affects Norwalk, which has the GREATER need for urban school district subsidies based upon our higher population of students with greater spending needs, its fair for taxpayers to question the policy of trying to compete on spending per pupil. In 2016, according to CREC, Stamford’s per capita tax rate was $3,753 and Norwalk’s $3,365. For that, they not only spent more per student, but provide more services to about 76,000 more citizens in general. I continue to question why it was an acceptable objective is to try to move us from the 20th percentile in performance to the number one performer in the state in only five years, without FIRST determining if there was going to be sufficient revenue to pay for that plan ALONG with all the other five year objectives for the City. I would love to see any real world example of a school system who moved their performance that much in a five year time span, and benchmark whether our strategies and investments are the ones that proved to be the critical factor. I would also like to see exactly when the BOE projected that we were going to hit the tipping point that takes us out of the alliance districts and how we are going to make up for the funds that we cannot get access to when we are not in that group. On the other hand, if you are successful, that would put you in the top ten performers, a category that can permit you to waive the MBR. The final approved budget will certainly not be an $11.7 mm increase and the contractual obligations alone are nearly $6 million. Assuming we only get the contracted increases of $6 million, there would be another $6 million next year putting us at the near $12 million. What would be sacrificed are the necessary program improvements that have been proven to be closing the achievement gap. Of a zero percent increase would mean we’d need to work backwards and cut $6 million in programming each year. We’d be looking at things like eliminating all afterschool activities for that to happen and still meet legal educational requirements. The MBR – minimum budget requirement – gets thrown around a lot as an excuse for not keeping up the school system, but acting strictly on it alone would devastate the system and with it our city.. In the end, I think we’ll have a sustainable measured outcome and be able to move the needle forward. The realtor community is very interested in our goals and that should be comforting to those with significant equity investments in local property even if they don’t have children in the system. hang on to your wallets,here we go again. I agree with Deborah. In particular, why did the BOE think that the goal of being #1 in the state was feasible? Or even desirable considering the proposed cost to get us there. The close-the-gap mania that Adamowski takes with him on each new job seems to be calculated to eliminate-the-gap. This is an issue across the country. Just follow the teachers who are teaching to each child and stop raising the bar measured by standardized testing scores. Year after year, we are telling the same kids that they are failures. What possible motivation to succeed is this? “That means outcomes vs. dollars spent can and should be improved, not just spending.” They have been. As noted in several of NON’s articles, not only have we surpassed achievement levels of our peer DRG communities on a variety of measures (not just standardized tests), but we have shown the second highest growth in state achievement measures of any school district in the State. “When you throw in the fact that ECS funding continually disproportionately affects Norwalk, which has the GREATER need for urban school district subsidies based upon our higher population of students with greater spending needs, its fair for taxpayers to question the policy of trying to compete on spending per pupil.” It would be, if we were trying to compete with Greenwich or Westport on spending. We aren’t. We’re just trying to reach parity with Stamford (which is the only community in the state as badly underfunded by the ECS as Norwalk is). “I continue to question why it was an acceptable objective is to try to move us from the 20th percentile in performance to the number one performer in the state in only five years.” You can stop questioning; that was never our objective. We know that given the socioeconomic challenges of our population, we will never be able to match the performance of wealthy communities than don’t face those challenges (while spending as much as $100,000 per year more per classroom than we do). That’s why our ACTUAL objective was a very reasonable one – as stated in our Vision Statement in the 2016-2019 Strategic Operating Plan, our goal is for ours to be “the most successful CITY school system in Connecticut.” And we’re already there. See https://norwalkps.org/UserFiles/Servers/Server_71596/File/Strategic%20Plan/FINAL%202016-2019%20Strategic%20Operating%20Plan%2008162016.pdf, p. 3. “Year after year, we are telling the same kids that they are failures. What possible motivation to succeed is this?” I honestly haven’t a clue where this statement comes from. Our student achievements – in everything from graduation rates, to English and Math learning, to English language learners’ success in learning English, to having schools reaching or closing in on state recognition as Schools of Distinction, to winning sports and music championships, are outstanding – and are continuously recognized. To take just one example, the hundreds of students now enrolled in our Early College Academy at Norwalk High School are highly motivated and accomplishing great things – the first graduating class last year included many who simultaneously received Associates’ degrees from Norwalk Community College with their high school diplomas. ‘Telling them they’re failures’? If anyone’s doing that, it isn’t us. See https://www.norwalkps.org/UserFiles/Servers/Server_71596/File/departments/Communications/State%20of%20the%20Schools.pdf. The curious need of some Norwalkers to bash their own town and all efforts to improve it – which I’ve seen continuously all the way back to the start of my government career here in the ‘80’s when efforts to create the Maritime Aquarium were vociferously attacked — leaves me shaking my head sometimes. Those of us actually trying to make things better will just keep plugging along anyway. Thats because we spend it all on the payroll of the staff! Norwalk is alwways one of the top paid districts in the state. We never had assistant principals in the elementary schools. They make $125000 plus. Athletic directors making $175000 a year. On and on. But we tell the middle school children no sports because we cant afford a bus to drive them from west rocks to nathan hale or vice versa. My mom worked as a secretary at Silvermine for 20 years and would often joke how the principal was on the golf course or at a kiwanis lunch. She would roll in her grave to see what these asst principals make. Common sense doesnt play a role here, just make sure you get your piece of the pie at all costs. Questioning isn’t bashing. The word CITY was pointed out to me today by someone else. So I stand corrected on that, but I caution all of the people associated with BOE presentations not to drop this word, because I’ve heard that sentence more than once with the word CITY omitted. You’ll have to pardon the citizens who don’t have the time to fact-check every sentence spoken in these meetings. Nobody appreciates the constant game of “gotcha”. Which begs two additional questions (not bashing): Is the spending reasonable to hit the target of being #1 out of 9 schools in our DRG? Should we scale back on the strategic plan spending given that we have already hit this target? Once more, I’ll point out that I am not talking about spending per pupil, or achievement improvements. I’m talking about measuring the ratio between the former and the latter. You say we have the second highest improvement in the state. But is it the second highest performance relative to the amounts spent? Many thanks for your willingness to educate (pardon the pun) the rest of us! Please share your findings. When you are researching this, please note that all municipalities pay OPEB, none of them can force anyone into staying on past 65, and all are constructed out of agreements covered by some of the most taxpayer unfriendly labor laws in the 50 states.